In general, in one aspect, the disclosure describes a method for use in electronic content distribution. The method includes storing sets of metadata corresponding to different electronic content titles available for distribution in accordance with different, respective, non-affiliated electronic book digital rights management schemes. At least some of the sets of metadata indicate at least one authorized retailer. The method also includes determining one or more sets of metadata for a retailer, the determined sets corresponding to electronic content the retailer is authorized to retail, and generating an output file of content available to the retailer that includes at least a portion of the determined sets of metadata. This application relates to U.S. patent application Ser. No. ______, filed on the same day as the present application, entitled “Processing Content for Electronic Distribution using a Digital Rights Management System”; and U.S. patent application Ser. No. ______, filed on the same day as the present application, entitled “Fulfilling a Request for an Electronic Book”. DRM solutions differ significantly in their approaches to the task of controlling access to eBooks. For the purposes of illustration, however, FIGS. 1 and 2 depict a typical DRM scheme. As shown in FIG. 1, a client  104, such as a PDA or personal computer, can send a message 108 to a server 100 over a network 102 such as the Internet. The message 108 requests access to an eBook and includes credentials of the requester such as the identity of the device 104 and/or reader software making the request. The server 100 uses the credentials to scramble (i.e., encrypt) the data of the requested eBook. As shown in FIG. 2, the server 100 then sends the scrambled data 106 to the requesting client 104. Using its own credentials, the client 104 reader can unscramble (i.e., decrypt) and present the eBook to a user. If a device other than the client 104 receives the eBook data, it should lack the proper credentials needed to perform the unscrambling. In general, in another aspect, the disclosure describes a computer program product, disposed on a computer readable medium, for use in electronic content distribution. The program includes instructions for causing a processor to store sets of metadata, at least some of the sets of metadata corresponding to different electronic content titles available for distribution in accordance with different, non-affiliated electronic book digital rights management schemes. Some of the sets of metadata indicate at least one authorized retailer. The program further includes instructions for causing a processor to determine one or more sets of metadata for a retailer, the determined sets corresponding to electronic content the retailer is authorized to retail, and generate an output file of electronic content available to the retailer, the output file including at least a portion of the determined sets of metadata. FIGS. 1-2 are diagrams illustrating an example of an electronic book digital rights management system. FIGS. 5-11 are screenshots of a user interface presented to a publisher. FIGS. 16-18 are diagrams illustrating fulfillment of a request for an electronic book. FIG. 19 is a flow-chart of a process for fulfilling a request for an electronic book. FIG. 3 shows a server  210 that can provide a variety of features that can ease tasks involved in electronic and printed book distribution. To illustrate some of these features, FIG. 3 shows a sample sequence that begins with submission 222 of a title from a publisher 204 and ends with the title's distribution 228 to a consumer 208. As shown in FIG. 3, a publisher client  204 can submit content 222 for a title to the server 210 over a network 202 such as the Internet. Such content can include data specifying text, graphics, and even multimedia such as music or video. The publisher client  204 can also submit information about the content known as “metadata”. The metadata can include identifier information such as the ISBN, UPC, or DOI of the work; pricing information for one or more markets in which the work may be sold; bibliographic information such as the author and title of the work; distribution information such as identification of territories where selling the work is authorized, retailers authorized to sell the work, and/or identification of one or more digital rights management systems for protecting the work when distributed electronically; and/or manufacturing information, such as a printing and/or binding specifications, for use in the preparation of hard copies of the work. The server  210 can automatically prepare the content for distribution. For example, for electronic distribution, the server 210 can automatically format eBook information for distribution of the title in accordance with one or more selected digital rights management systems. For hard copy manufacturing and distribution, the server 210 can automatically prepare the content for printing, for example, by extracting a cover page for color printing and generating bit-map images of book pages. In addition to the behind-the-scenes work of preparing content for distribution, the server  210 may also provide information to retailers 206, such as Amazon.com and BarnesandNoble.com, to help display and sell titles. For example, the server 210 may use collected metadata to generate a customized catalog file 224 of content authorized for sale by a retailer 206. The catalog file 224 can include author names, a summary, and/or selected images (e.g., book cover thumbnails). A retailer 206 can use the catalog file 224 to automatically update its web-site's offerings. For example, Amazon.com can automatically generate web-pages for newly available titles identified in the catalog file 224. The server  210 can also insulate retailer 206 from the technical details of title distribution across multiple digital rights management systems. For example, after a consumer 208 selects an eBook from the retailer's 206 web-site 226, the server 210 can distribute 228 the title to a consumer 208 in accordance with a digital rights management system selected for the content. This frees the retailer 206 from the burden of setting-up, integrating, and maintaining a host of different digital rights management systems that different eBook formats may require. Similarly, for a hard copy, the server 210 can offer a “print-on-demand” service that produces a hard copy of a title for delivery to a consumer or retailer. Though FIG. 3 depicts a single publisher  204, retailer 206, and consumer 208, the server 210 can support a very large number of each of these entities. Further, while the server 210 may constitute a single computer, the server 210 may instead represent a logical collection of devices. While the description above highlights a few features offered by the server  210, the server 210 can also offer a wide array of other services such as providing reports (e.g. usage reports, title demand reports, retailer invoices, and publisher compensation) to retailers 206 and publishers 204. A server 210 may offer all of the features described above or only support a limited subset of these services. These and other features are described in greater detail below. FIG. 4 illustrates a scheme that enables a publisher  204 to securely transmit content 230 over a network 202 to a server 210 for subsequent electronic distribution and/or hard copy printing. As shown, in addition to content 230, the server 210 can also receive metadata 232 corresponding to the content. Such metadata can include bibliographic information about the content, “print- on-demand” information used to generate a hard copy of the content, and/or distribution information such as identification of retailers authorized to sell the content and/or identification of one or more electronic book digital rights management (DRM) systems. For security, the server 210 and publisher client 204 can communicate over a secure network connection, such as HTTPS (HyperText Transfer Protocol Secure), that encrypts/decrypts information communicated by the publisher's client 204 and the server 210. The server  210 can use the received content 230 and metadata 232 to automatically generate distribution versions of the content. For example, for electronic distribution, the server 210 can automatically prepare a version of the content for distribution in accordance with the identified DRM scheme(s). Similarly, for hard copy printing, the server 210 can automatically generate a version of the content, for example, by preparing an image of each page to be printed. As shown in FIG. 4, the server  210 includes a content management 214 system that stores and processes the received content 230 and metadata 232. The server 210 also includes a fulfillment system 220 that features instructions for different digital rights management systems. For example, the fulfillment system 220 may support DRMs from non-affiliated vendors. For instance, the system 220 may feature Microsoft Reader Digital Asset Server and Adobe Content Server Digital Rights Management System. As shown, the server  210 may also include web server instructions 212 that make these features available to a publisher 204 via an Internet web-site. In technical terms, the web server instructions 212 handle HTTP (HyperText Transfer Protocol) messages exchanged with network clients (e.g., web browsers). These messages can include, for example, instructions for presenting a user interface that transmits information collected from a remote user back to the server 210. Such user interface instructions may be encoded in a variety of ways such as SGML (Structured Generalized Markup Language) instructions (e.g., HTML (HyperText Markup Language) and XML (extensible Markup Language)) or instructions that include conditional statements (e.g., “IF” statements) such as an applet. FIGS. 5-11 illustrate samples of user interface screens the server 210 may provide to a publisher to collect content and metadata. These sample screens depict stages of a sample process of content submission that includes selecting one or more distribution options, providing information for the selected options, monitoring the processing status of submitted content, and proofing a distribution version of the content. The following sequence may be preceded, for example, by user interface screens that enable a publisher to set up an account. For instance, a publisher may provide banking or credit information for billing and/or compensation. As shown in FIG. 5, after establishment of an account, content submission can permit user selection of hard copy “print- on-demand” preparation  262 and/or eBook distribution 264 of the content. As shown, a publisher selecting eBook distribution 264 may also select one or more DRM schemes for eBook distribution (e.g., “MS Reader Format” 266 or “Adobe eBook Format” 268). As shown in FIG. 6, a user interface screen may collect some metadata applicable to both ebooks and “print-on-demand” titles. For example, as shown, the user interface can collect a title  271, a publisher reference number 272 such as an ISBN (International Standard Book Number), a language 273, a list of contributors 270, and a summary annotation 277. The user interface may also collect a publication date 274 and/or a “street date” (the date the publication may first be offered for sale) 276 that represents a date in the future before which the publisher does not want distribution to occur. As shown, the user interface also enables a publisher to select a method of delivering content  278 to the server. For example, a publisher can select file upload over the Internet, physical delivery of a computer readable medium (e.g., a CD-ROM or floppy), or a hard copy for scanning or other conversion into electronic form. The publisher can similarly specify 279 a mechanism for uploading a book cover image. The information collected from a publisher may differ depending on the distribution methods selected. For example, FIG. 8 shows additional information collected for eBook distribution. As shown, the user interface can enable a publisher to select different DRM options  284, 286 supported by selected DRM systems. For example, Adobe Reader options 286 can give a publisher control over consumer printing and copying based on a maximum number of days or copies. As shown in FIG. 9, information collected for content selected for “print-on-demand” may differ from that collected for eBook distribution. For example, as shown, the user interface may collect user input specifying a type of binding  288 and/or the text 290 to print on the book spine. Again, after receiving the metadata entered by the publisher and the content, the server can automatically prepare the content for distribution in the publisher selected format(s). After doing so, the server may generate one or more “proofing” copies of the distribution version(s) of the content. For example, the server may prepare and transmit an eBook to the publisher or, in the case of “print-on-demand” content, the server may prepare an Adobe PDF (Portable Document Format) file featuring images of the pages as they would be printed. In either case, as shown in FIG. 10, a publisher can accept  292 or reject 294 the proofing copy by interaction with the user interface. Accepted proofs will be made available for distribution. FIG. 12 shows a process  240 for automatic handling of content submission. As shown, the process 240 may begin with receipt 241 of content and its corresponding metadata. The process 240 can handle a wide variety of content formats such as Adobe Acrobat PDF, PostScript, QuarkXpress, PageMaker, InDesign, Word, and tagged text formats such as HTML. Many of these content formats do not include conditional statements. As shown, the process  240 may validate 243 received metadata. For example, the process 240 may ensure that no metadata specifies a wholesale discount over %50. The process 240 may also validate an ISBN number, for example, by verifying the number's check digit. A wide number of other metadata validations may take place such as a request of payment authorization from a publisher's credit source. After receipt  241 of the content and metadata, the process 240 automatically checks (“pre-flights”) the content for numerous issues which might prevent accurate automatic preparation of a title. For example, the process 240 may verify receipt of all image files and required fonts. Should an error be encountered, the server can automatically notify the publisher and await resubmission. Assuming the metadata validation  243 and pre-flighting proceeded without significant error, the process 240 can continue converting the received content to selected distribution format(s), for example, by reflowing and repaginating text, replacing images, and so forth. If the selected distribution format(s) include hard copy distribution  245, the process 240 can automatically perform a number of tasks that prepare the content for printing. For example, for text submissions, the process 240 can parse the content to construct 247 a table of contents. The process 240 can also perform a wide variety of other tasks such as analyzing the structure of text to indent the first paragraph of a new chapter more than other paragraphs. Similarly, the process 240 may alter text, for example, by compressing three consecutive periods into a single ellipses character or using an elongated dash instead of using a simple “-” character. The process 240 may also perform other tasks, such as extracting a cover image from the content. As shown, the process  240 can calculate 249 a spine width for a manufactured book based on page thickness and the number of pages. The process 240 can also determine a spine image for the binding, for example, by creating an image of the title in a font that fits the spine width. After automatically generating information for printing the content, the process  240 can generate 250 a proof copy, for example, by e-mailing images of the pages to be printed or by sending a hard copy of the title for publisher review. After review, the process 240 can send 251 the generated information for the title to a manufacturing engine that can control printing of the title on demand, for example, by printing a color cover, printing a book block, and binding the printed cover and book block. A different sequence may occur if the selected distribution format(s) include electronic book distribution  253. For example, the process 240 may process the content to generate 255 one or more Open eBook (OEB) files. For instance, the process 240 may include extraction of a cover page from submitted content and/or lossy compression of submitted images to reduce the size of any distribution files. Based on these OEB files, the process  240 may generate 257 DRM specific files. Generation of DRM specific files may include DRM specific conversions. For example, for an Adobe eBook generation may include construction of an Adobe style hyperlinked table of contents, a copyright page updated to include eBook ISBN, and logical page numbers that permit eBook pages to match a title page numbering sequence. 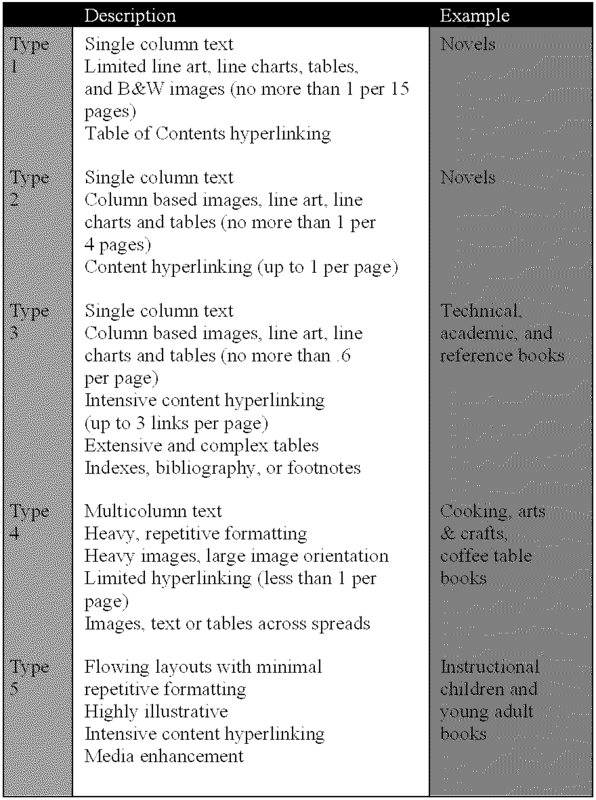 For a Microsoft eBook, generation may include construction of a Microsoft style floating hyperlinked table of contents, a copyright page updated to include eBook ISBN, and conversion of non-supported book layouts (e.g., marginal notes, floating art, cross spread images or boxes, conversion of footnotes to endnote, placement of footnote as display text, and placement of images or graphics close to, but not preceding, the callout). Additional advanced features may also be available at the option of the publisher. These can include linked index entries, removal of blank pages, cross- referencing, contextual links, listings of figures and tables, and links from text reference of a figure to the figure or a footnote text reference to an endnote. After proofing 259, the completed DRM specific file is posted 261 to a DRM Engine (described below) for subsequent distribution. As shown, after generation of a title in the selected distribution format(s), the process  240 may store 260 the title's metadata in a database of metadata corresponding to different titles. As described below, this stored metadata can be used to construct a catalog of titles for a retailer. As shown in FIG. 13, a server  210 can include catalog generation and distribution instructions 218 that can generate a “catalog” 300 of titles a retailer is authorized and desires to sell. The catalog 300 can list titles available to a retailer and can include some or all of the metadata submitted with a title. Additionally, the catalog generation instructions 218 can customize the format of the catalog 300 for a particular retailer 206, for example, to work with software the retailer may use to manage title information. For instance, the retailer 206 may feature software that automatically processes a received catalog 300 to create new web-page information for new titles or amend web-page information for pre-existing ones. FIG. 14 illustrates an example of catalog  300 generation. As shown, a process 308 selects catalog 300 data from stored metadata records 310. The metadata records 310 correspond to submitted titles and can include information identifying one or more authorized retailers and/or one or more unauthorized dealers. The process 308 can use the information to select metadata records of titles a particular retailer is authorized to handle. For example, metadata records  302 and 306 designate “Amazon” as an authorized retailer for eBooks of John Grisham's “The Firm” 302 and “The Chamber” 306. Thus, the catalog 300 generated by the process 308 can include records for these titles, for example, as a result of an SQL (Structured Query Language) query for records listing “Amazon” as an authorized retailer. Since different retailers may use different software and/or data formats to process title records, the process  308 can customize the catalog 300 file generated for a particular retailer by using customized formatting information 312. Such formatting information 312 can specify the metadata to include in the catalog 300 and the arrangement and encoding of included metadata. For example, as shown, the catalog 310 features a semi-colon delimited record for each title. That is, a semi- colon separates different fields of the record. Alternatively, catalog 300 records can be encoded in a markup language for easy incorporation into a retailer's web-pages. For example, a record of “<TITLE>The Firm</TITLE> <AUTHOR>Grisham</AUTHOR>” includes <TITLE> and <AUTHOR> markup tags that identify the information included in the record. In addition to text and other data, a retailer may also prefer to receive an image of a book cover for display by their web-pages. Such images may be included as data within a catalog, for example, as JPEG (Joint Picture Experts Group) or GIF (Graphics Interchange Format) image data. Alternatively, each title may have corresponding images stored at a FTP (File Transfer Protocol) site in accordance with a naming convention such as title_xpixelsize_x_ypixelsize.format (e.g., TheFirm —600_x—400.jpeg). FIG. 15 illustrates an example of a process  330 that the catalog generation instructions 218 may implement. As shown, the process 330 selects 332 metadata records of titles for inclusion in a retailer's catalog. The selection 332 can feature both “authorization filters” that restrict retailers to titles they are authorized to sell and “retailer defined filters” that prevent retailers from catalog inclusion of works they are not interested in selling or promoting. The “retailer defined filters” enable a retailer to specify characteristics of works that the retailer does not want to sell or promote. For instance, “Bob's Sci-Fi eBook Store” may only be interested in publications categorized as science or science fiction. Thus, in this example, the process  330 may check to limit titles included in a Bob's catalog to only include titles in these categories. Similarly, a retailer, for example, may request only those titles approved by some organization. As described above, information for titles selected for inclusion in the catalog may be formatted  334 according to retailer preference. After completing the selection 332 and formatting 334, the catalog may be transmitted 336 to the retailer. Transmission may occur, for example, via e-mail or a sequence of HTTP messages. Transmission may alternatively occur by storing the catalog in an FTP (File Transfer Protocol) directory accessible by the retailer. This latter option enables the retailer to control when and how often the catalog information is received. The process  330 shown in FIG. 15 may be programmed to automatically repeat at a designated interval. For example, a retailer may request automatic generation of a catalog on a daily or weekly basis. For retailers receiving more than one catalog at different times, the process 330 may generate “delta” catalog files that only include changes from a preceding catalog. For example, the catalog may only include new titles authorized for sale by a retailer or new/changed information about titles in a previous catalog or catalogs. A server  210 may provide a web-site that enables consumers and/or publishers to request electronic books or “print-on- demand” hard copies of a title. However, as described above, retailers often handle the task of presenting titles to consumers for purchase. For example, Amazon.com allows consumers to search lists and descriptions of different available eBooks. In the case of eBooks, fulfilling purchase requests can add the burden of DRM system maintenance and support to a retailers responsibilities. FIGS. 16-18 illustrate a system that can remove the burden of handling these fulfillment duties from a retailer. As shown in FIG. 16, a consumer  208 can interact with a retailer 206 over a network 202 through mechanisms selected by the retailer 206 such web-pages, email, and so forth. After a consumer 208 requests 322 an eBook title, for example, by selecting a title from a web-page 320, a fulfillment process 220 provided by a remote server 210 handles distribution of the eBook to the consumer. The server 210 may be the same server 210 providing other features described herein. As shown in FIG. 17, the retailer  206 transmits fulfillment information 324, such as a URL (Universal Resource Locator) link, to the consumer 208 for each purchased eBook. For example, the retailer 206 may include the URL in an e-mail message sent to the consumer 208 or may include the URL in a dynamically constructed web-page that lists items requested by a consumer 208.
where “https” identifies a secure connection between the consumer  208 and server 210, “server.com” identifies the location of the server 210 in the network, and retailerID and item ID identify the retailer and ordered item SKU (Store Keeping Unit, the product identifying number used by the server 210), respectively. The URL parameters may be encrypted, for example, using Triple DES. Additionally, the URL may feature additional parameters such as a time stamp and/or the results of a hashing of the other parameters to thwart pirate attempts to construct a valid URL. The URL may also include a tracking number assigned by the retailer to the transaction for retailer tracking purposes. As the server 210 may insulate the retailer 206 from DRM tasks, the URL need not include identification of any particular DRM system. As shown in FIG. 18, after receiving the eBook request, the server  210 handles distribution 332 of the eBook to the consumer in accordance with the digital rights management system associated with the title. After distribution 332, the server 212 can transmit confirmation 333 to the Retailer 206 describing both successful delivery of the content or, in the event of a failure, what the reason for failure. As shown, the server  210 supports multiple DRM systems. While each DRM system may operate differently, many share a similar sequence. In a typical scenario, DRM distribution of a title begins when a DRM system attempts to connect to the consumer's 208 reader software. If the reader software is not installed, the system can guide the consumer through a download/installation process. The DRM system then requests credentials (e.g. computer ID, reader software ID) and uses these credentials to “lock” a copy of the ordered title for that consumer. Such locking may occur by encrypting a copy of the title or providing an encrypted voucher needed by the reader software to open a generically encrypted copy of the title. A “locked” copy of the title is then sent to the consumer 208. The consumer's 208 device then automatically launches the reader software associated with the DRM scheme used and loads and presents the title. While the process described above may seem complex, the entire process happens in real-time and, typically, does not take more time than loading a standard web page. The scheme described above can offer a number of potential benefits. Again, by server  210 handling fulfillment, retailers need not be aware that DRMs are even being used. Additionally, while FIGS. 16-18 illustrate distribution of a title for a single retailer 206, the server 210 can support many different retailers and their consumers simultaneously. Thus, addition of a new DRM system at the server 210 can expand the number and variety of product distribution capabilities of many retailers. The server  210 may implement DRM handling by bundling instructions for different DRM systems into a DRM Processing Engine. The server 210 may include many different DRM Processing Engines operating in parallel. This technique can permit load balancing between the DRM Processing Engines and provide scalability as the number of fulfillment operations increases. Additionally, new DRM Processing Engines can be added or removed at any time without impacting system availability. FIG. 19 illustrates a title fulfillment process  350. As shown, the process 350 receives a request for a title 352. The process 350 may then verify security information (e.g., a hash value) received with the request. This may trigger transmission of a confirmation message (e.g., an HTTP message) to the retailer. This provides retailers with virtually real-time confirmation of consumer use of an the order link supplied by the retailer 206. These confirmation messages may be queued for retransmission when a retailer's 206 web-site is down. The confirmation message may include identification of the ordered title and/or a order number, among other information. As shown in FIG. 19, the process  350 may determine 354 whether to distribute the electronic book to the network client in accordance with one or more business rules applied 354 independent of DRM operation. For example, a business rule may verify that the retailer identified in the request is authorized to sell the title. A different business rule may deny access to a title before a street date specified by the publisher. Yet another business rule may verify that the consumer is not downloading the book to different devices or exceeding a maximum number of downloads. As new requirements emerge, business rules may be created and/or updated. The business rules may be encoded, for example, as boolean expressions or in a programming language such as C and/or SQL (Structured Query Language). If a business rule indicates distribution should not occur 358, the process 350 can transmit 360 corresponding error messages and/or customized screens to the retailer and/or consumer. After business rule application, the process  350 may determine 362 a DRM system selected for the title. For example, server instructions may use the received retailer ID and the title ID of the request to perform a table lookup of DRM systems associated with the title by the retailer. Thereafter, the title can be distributed 364 in accordance with the determined DRM. As specified by a DRM or business rule, successful downloading of titles may be noted to prevent the consumer from re-downloading the same eBook using the original URL link. Failed downloads may not be recorded to enable a consumer to attempt to re-download in the event of a bad Internet connection. As shown, the process  350 may log 366 information describing a transaction, for example, by logging information used in billing, determining publisher compensation, business rule 10 audits, determining DRM usage fees, and so forth. Again, throughout the process  350 illustrated in FIG. 19, retailers and/or consumers may receive status and error messages regarding the progress of their request. Examples of events that can cause notification include the occurrence of unknown errors, completion of a successful download, a determination that a title was not found or available, a determination that the consumer did not order the title from an authorized retailer, a determination that the download attempt exceeded a limit, the occurrence of communication errors, a determination that reader software was not installed or activated, and a determination that the received consumer credentials were incorrect. While the server may offer a predefined set of status and error message web pages, these messages may be customize in real-time to each retailer's specifications. Alternatively, events can trigger a re-direct to a web-page provided by the retailer's web-server. Again, the process  350 may provide retailers with status information such as confirmation of an order. For example, a server may transmit a confirmation message to a retailer that encrypts the order tracking number, time stamp, and other information. generating an output file of content available to the retailer, the output file including at least a portion of the determined sets of metadata. 2. The method of claim 1, further comprising customizing the output file for a retailer. 3. The method of claim 2, wherein customizing comprises formatting the metadata. 4. The method of claim 2, wherein customizing comprises identifying metadata to include in the output file. 5. The method of claim 1, wherein generating an output file comprises generating an output file indicating changes from a previously generated output file. 6. The method of claim 1, wherein determining and generating comprise determining and generating at a specified interval. 7. The method of claim 1, further comprising further restricting the determined sets of metadata for a retailer. 8. The method of claim 7, wherein further restricting the determined sets of metadata comprises restricting based on at least one of the following: a title territorial constraint, title street date, and specification of title price. 9. The method of claim 7, wherein further restricting comprises restricting based on characteristics identified by the retailer. 10. The method of claim 9, wherein restricting based on characteristics identified by the retailer comprises restricting based on at least one of the following: subject matter and organization rating. 11. The method of claim 1, further comprising transmitting the generated output file to a retailer computer. 12. The method of claim 11, wherein transmitting the generated output file comprises storing the output file in an FTP (File Transfer Protocol) directory accessible by the retailer. 13. The method of claim 1, further comprising providing access to at least one image corresponding to electronic content the retailer is authorized to retail. 14. The method of claim 13, wherein the at least one image comprises an image of a book cover. 15. The method of claim 1, wherein the metadata comprises an identification code for the corresponding electronic content. incorporating information included in the output file in a retailer user interface display. receiving a request for the electronic content, the request including the identification code and being transmitted in response to buyer interaction with the retailer user interface. 18. The method of claim 1, wherein at least some of the sets of metadata correspond to content printed and bound in response to a received request. generate an output file of electronic content available to the retailer, the output file including at least a portion of the determined sets of metadata. 20. The computer program of claim 19, further comprising instructions that cause the processor to customize the output file for a retailer. 21. The computer program of claim 20, wherein the instructions that cause the processor to customize comprises instructions that cause the processor to format the metadata. 22. The computer program of claim 20, wherein the instructions that cause the processor to customize comprise instructions that cause the processor to identify metadata to include in the output file. 23. The computer program of claim 19, wherein the instructions that cause the processor to generate an output file comprise instructions that cause the processor to generate an output file indicating changes from a previously generated output file. 24. The computer program of claim 19, further comprising instructions that cause the processor to transmit the generated output file to a retailer computer. 25. The computer program of claim 19, wherein the metadata comprises an identification code for the corresponding electronic content. 26. The computer program of claim 25, further comprising instructions that cause the processor to receive a request for the electronic content, the request including the identification code and being transmitted in response to buyer interaction with a retailer user interface constructed from information included in an output file received by the retailer.